Victorian Registry, Federal Court of Australia (VID513/2015). Money Max Int Pty Ltd v QBE Insurance. Michael Lee SC and William Edwards. International Litigation Funding Partners Pty Ltd (‘ILFP’). The claim is settled subject to Court approval with consent orders made on 27 October 2017; including 27 November being fixed as the date before which opt out may occur and registration to participate in any settlement. People who at some time during the period 20 August 2013 to 6 December 2013 inclusive, acquired an interest in ordinary fully paid shares in QBE and who have not opted out. On 9 December 2013 QBE announced that it was not going to meet earlier profit and financial performance guidance and that, in fact, it was expecting to incur significant write-downs and post a loss of around $250m for FY13 (ending 31 December 2013). When confirmed in February 2014, the reported loss of $254m was the first for the company since 2001. The major contributor to QBE’s poor results, and its shock announcement on 9 December 2013, was the bad news from QBE’s North American operations. 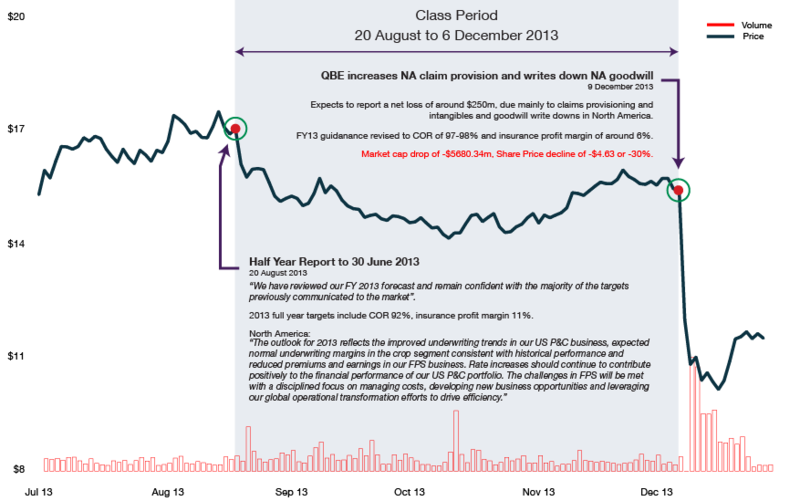 The revelation on 9 December 2013 for the poor results understandably surprised investors. Only four months earlier, QBE’s half year report in August 2013 fed market expectations of a profit in excess of $1 billion for FY13 and a turn-around of its problematic North American operations. existing QBE guidance was unreliable. Open class. Opt-out Notices not yet sent. $4.63 per share (Market cap drop of $5.68bn). Common Fund (26 October 2016).